A thank you to frolickauai@Flickr for today’s first-time contribution to Botany Photo of the Day (original | BPotD Flickr Group Pool). Much appreciated! Do investigate frolickauai’s other photographs on Flickr – plenty of plant photographs. Hibiscus clayi, or Clay’s hibiscus (or Hawaiian red hibiscus), is an extremely rare plant in the wild; as frolickauai notes: “This flower is on one of only four naturally occurring members of Hibiscus clayi in the wild.”. The wild, in this case, is Kaua‘i, Hawaii. Conservation efforts are underway to expand the population beyond the four individuals, and botanical gardens in the area are part of the effort (ref: US Botanical Garden summary). Despite being in a forest reserve, the remaining individuals remain under threat. 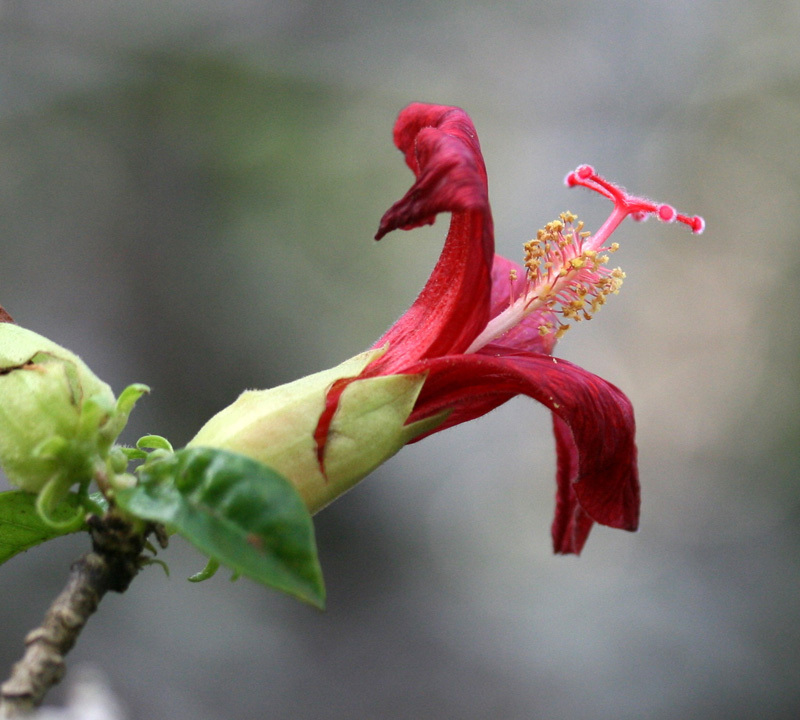 The profile of Hibiscus clayi on the US Center for Plant Conservation notes that competition with alien plants is the current major problem, although the initial decline was due in large part to cattle grazing (cattle are no longer a threat, though feral pigs are another issue). The Plants of Hawaii site contains photographs of Hibiscus clayi in cultivation, as well as a resource page about the species. I fell in love with a different hibiscus when i visited San Diego. Tried to grow some up here, but my thumbs are black, not green. They looked so friendly and lively I wanted some. Geographic location and flower shape imply bird pollination. If growing within altitudinal range of Avian malaria native pollinating birds may be absent, preventing adequate reproduction. Sue – if my mother-in-law can maintain a hibiscus collection in the Chicago suburbs, I’m sure you can too! My father-in-law did build her a small greenhouse, but before that, she overwintered them in the garage. They are lovely plants! What a nice Photograph today. Do any of the many Hibiscus have a lovely secent? I am still leaaning and really enjoy today’s offering. Unfortunately Margaret-Rae, as Ron pointed out, hibiscus’s are bird pollenated (at least all the varieties I’m aware of) and as such probably don’t really have scent. Birds, having keen vision but little to no sense of smell, are typically attracted to showy, red, trumpet-shaped flowers that don’t smell like anything. It doesn’t make sense for the plants to invest in expensive chemical signals if the birds can’t smell them anyways. They do, however, taste and smell very nice in teas. The “zinger” taste in Celestial Seasonings brand teas is because of hibiscus. I find it to be quite delicious. The Hawaiian native, Hibiscus arnottianus, is fragrant and is very beautiful as well. In which poem of Vergilius? Surely not in the Aeneid but in the Bucolics or Eclogues? I had fun looking up the fruits medlar in R.J and of course as always the flowers in Ophelias drowning and earlier madsong. In Hamlet o.c. Amor vincit omnia et nos cedamus Amori meaning of course not love but Aphrodites son and this love is the other kind. Sometimes a flower is just a flower.